One of my old school teachers used to pass on this little gem of wisdom to us in secondary school. Well, I didn’t have the pleasure of his teaching skills as such, as he was the commerce teacher, and I was only ever going to be found in the art room. But that quote stuck with me. Anyway, the point, if there is one at all, is to approach this particular elephant carefully. 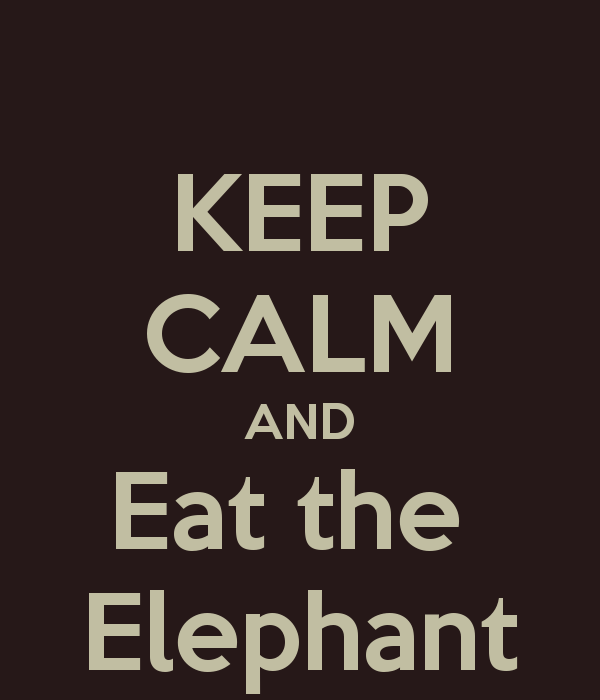 That’s another adage: how do you eat an elephant? One piece at a time. I have noticed an odd and dangerous thing creeping into my thinking since doing the Olympic tri. And bear in mind I am no seasoned pro. I have only done two Sprints and one Olympic. And now here I am gearing up for an Iron Man next year. So the odd psychological trick my mind is playing is that the Half-Iron will be handy enough. I am making the leap (at least in my mind) to the full distance without earning the right to. I suspect I am not the first to fall into this trap. I need to nibble away. Anyone with a decent level of fitness can do a Sprint, and with a little coaxing, you can fake an Olympic too. But there comes a point in any race when the body runs out of juice and things start to go pear-shaped (as an analogy, that one doesn’t really work, but you know what I mean). There’s nowhere to hide. Marathons have a good habit of doing that to a body. I used to think the wall was some psychological/mystical barrier until I discovered calories. As a rough figure, we burn about 100 calories in order to run a mile. We usually store about 1,800 of these as glycogen before we set off. These are all top of the head numbers, but what it means is that roughly about mile 18 of your marathon, if you haven’t been refueling along the way, you start to crash. Your tank is empty and the legs stop turning. That’s it really. There’s no mystery. I quite like the mysterious stuff, but I guess without a half-decent nutrition programme before and during any long distance race, I will struggle badly. And possibly not finish. And I’ve been at that ‘wall’ stage of a marathon and it’s a horrible place to be. Okay, it’s a ‘luxury problem’ place to be, I admit, in comparison to a lot of places you could be. Today is the first official day of training for Ireman in Ards on September 27th (it’s a half-iron). I will cycle down to the pool, do a swim session, and cycle back. It’s not terribly well thought through, but it’s a start, after a good run yesterday in the park. Or, put another way, any training is better than no training. Once I have an official plan, I will stick it up here somewhere. In other news, the smoothie-maker is still doing the business, though pineapple has been banned from the house since a few large chunks gave rise to some ugly noises and nasty burning smells from the motor. The Iron Cowboy also continues his saga Stateside, despite falling asleep and crashing off the bike.